What is Arizona’s equivalent to California’s famous Roscoe’s House of Chicken ‘n Waffles? Lo-Lo’s Chicken & Waffles, of course! Since it first opened in downtown Phoenix, Lo-Lo’s quickly became an underground sensation. Soon Lo-Lo’s was seating customers from around the world in addition to their loyal local diners. With so much success, they decided to expand and opened a second Lo-Lo’s restaurant in 2009 in South Scottsdale. 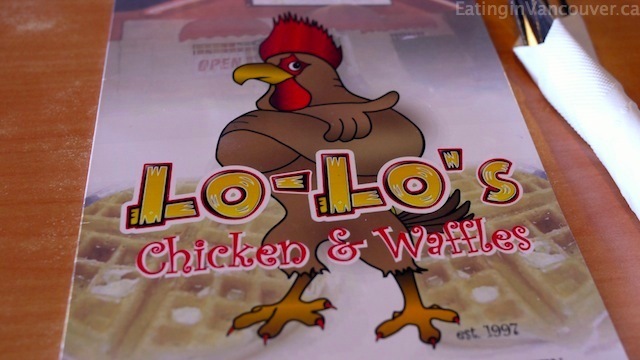 Lo-Lo’s Chicken & Waffles has welcomed countless celebrity customers such as Mary J. Blige, Snoop Dogg, Charles Barkely, and Muhammad Ali – just to name a few. When we visited, Grant Hill, his R’nB singer wife Tamia and their two children were dining across from us. Grant Hill Drinks Sprite (remember that commercial? )….anyway, we wanted to say hi, but didn’t want to interrupt their Sunday morning family breakfast. Aren’t we such polite Canadians! (Tamia responded to our Tweet, here). Lo-Lo’s has the BEST menu titles. Fo-real, yo. 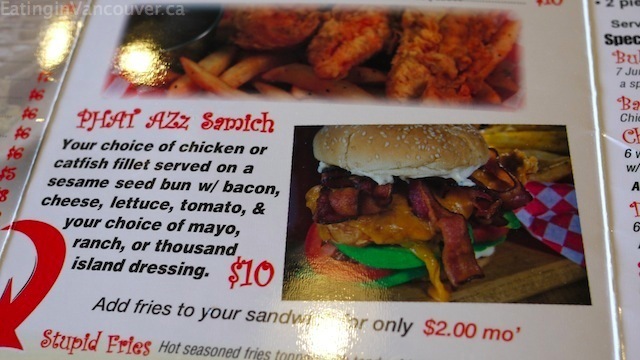 Under “Hood Classics”, you can order a “PHAT AZz Samich”, “Stupid Fries”, as well as “DVZ’s Hot Ghetto Mess” and their world famous Red Kool Aid “Drank”. And on top of those awesome names, employees wear t-shirts that say “Ghetto Superstar”. I mean come on, this place could not get anymore ghetto fabulous than this, even if they tried. We all ordered coffee with our meals, along with water. 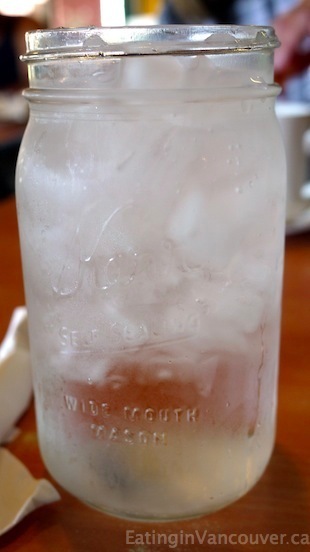 All of Lo-Lo’s cold beverages are served in huge mason jars. 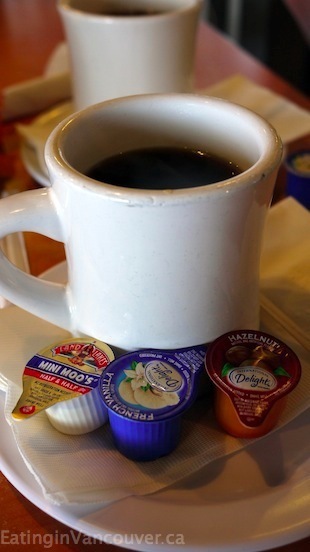 Our “dranks” were always being topped up, as we never saw the bottom of our cups. Service was excellent. 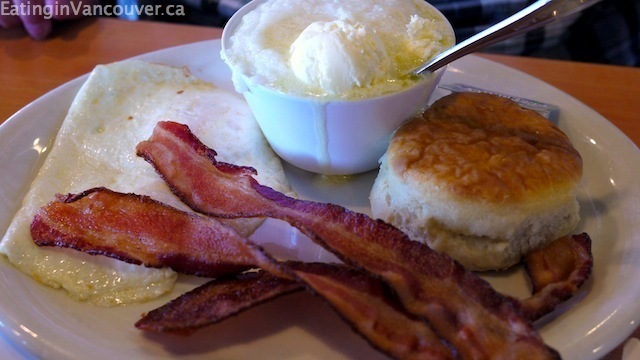 Phat Boy ($8) – Two eggs any style with grits, biscuit, choice of bacon, sausage, hot link, or turkey bacon. The eggs were perfectly cooked easy over; the three strips of of bacon were crispy; and the biscuit was beautifully fluffy. If you’re generally a fan of grits, then you’ll love the consistency and buttery flavor of Lo-Lo’s grits. Betty Boop ($8) – One juicy breast of Southern fried chicken with one of Lo-Lo’s famous golden waffles served with syrup and butter. This chicken breast was ginormous! Since it was all white meat, it was a tad on the drier side. The waffle was also a generous size and very tasty. If you’re unfamiliar with chicken ‘n’ waffles, it’s a Soul Food dish combining the best of both worlds: sweet breakfast waffles with savory Southern fried chicken. What could be better?! 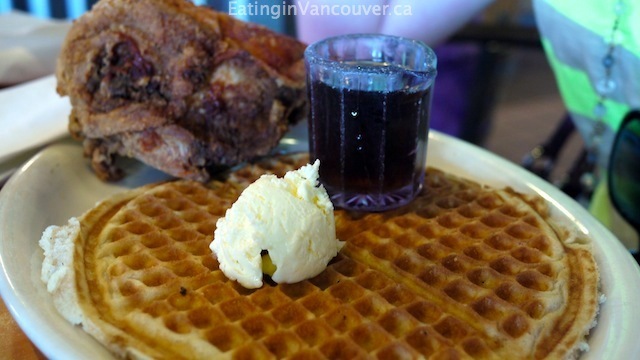 Eating in Vancouver has experienced a few chicken ‘n waffles dishes in Vancouver (IHOP and Refuel) and on the island (Sliders in Victoria), but none have been this authentic. Lo-Lo’s certainly takes the cake. 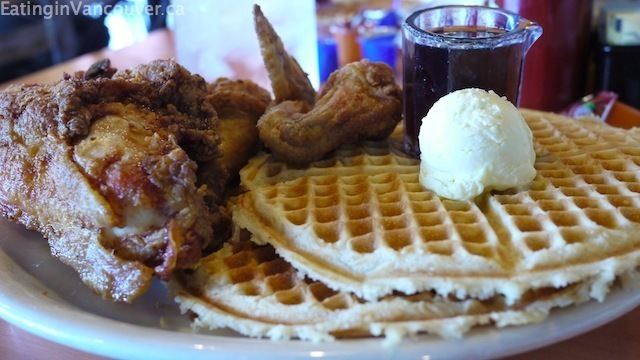 Lo-Lo’s ($12) – Three pieces of fried chicken prepared Southern style with two golden waffles. The skin was seasoned and perfectly crispy, and the dark meat was plump and moist. The deliciously sweet waffle possessed a subtle hint of cinnamon and was the ideal compliment to the savory fried chicken. Lo-Lo’s Chicken & Waffles was voted the best Soul Food restaurant in the Valley, and we can understand why. With friendly and helpful service, large portions and fun menu titles, this feel-good restaurant will make you want to keep coming back for more. You can bet we’ll stop by the original Lo-Lo’s Chicken & Waffles location in downtown Phoenix before we leave Arizona.